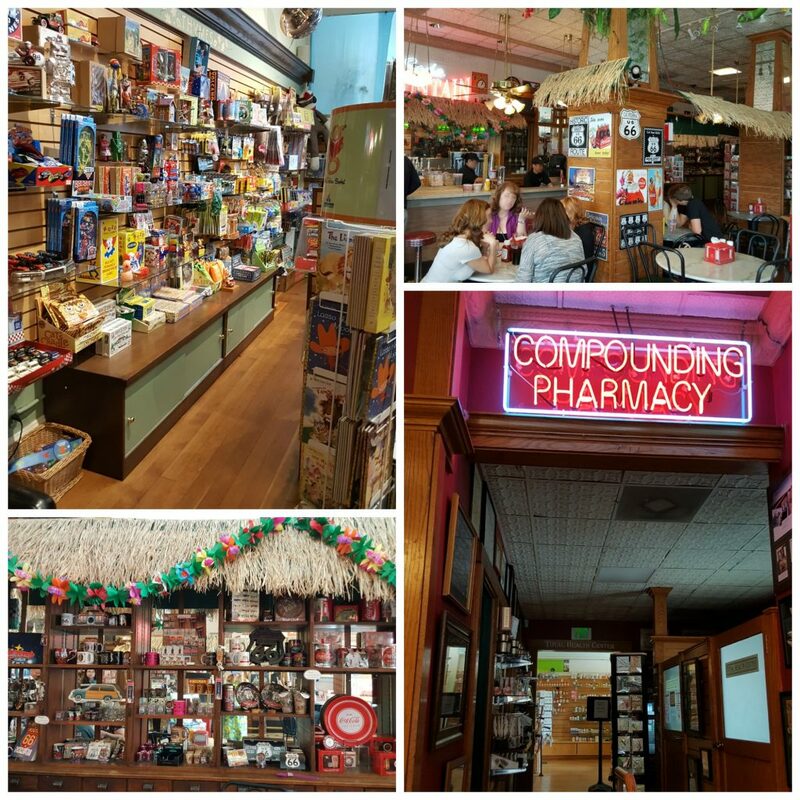 Located right along famous Route 66, Fair Oaks Pharmacy is a throwback to decades past when the local soda fountain drugstore was where the community would go for an ice cream, pick up some personal care, maybe little gift, and chat with friends and neighbors. Heck, Hollywood has a history of beautiful starlets being discovered in the local soda shop. 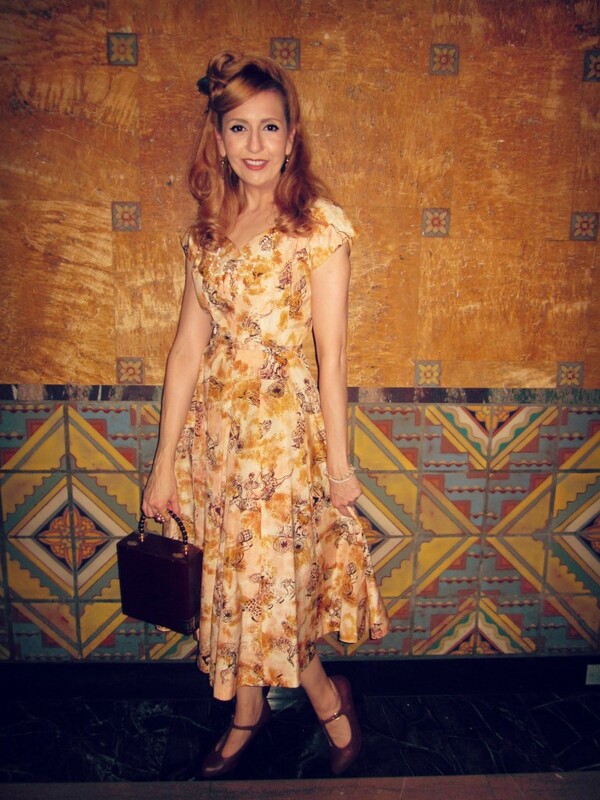 So it felt like stepping back in time when I went to meet some gals at this 100-year-old, vintage style, Pasadena institution for a vintage day out. The place is full of charm from its Tiki-style trim around shelves of retro memorabilia and toys. There’s a full room just for shopping for kitschy knick-knacks. If the giant ice cream sundaes aren’t enough to satisfy your sweet tooth, you can also pick up some can from the wall of candy jars featuring vintage flavors. Need a last minute gift? There’s full selection of bath and body products and greeting cards. You can even pick up a prescription from the health center, which is a full fledge compounding facility. Why don’t they make ‘em like this anymore? 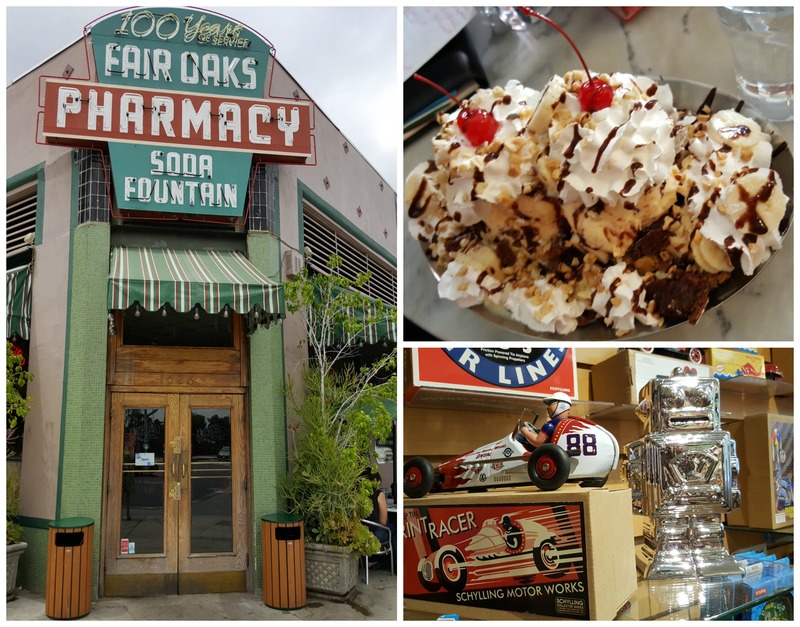 The Fair Oaks Pharmacy is an idyllic cornerstone to a quaint street of little shops that’s perfect for a stroll on a nice day. It’s only fitting to wear vintage style for such a historic spot. And on this perfect springtime California day, I wore one of my favorite, colorful, sheath dresses. I love that this one has a little belt to give it more shape definition. 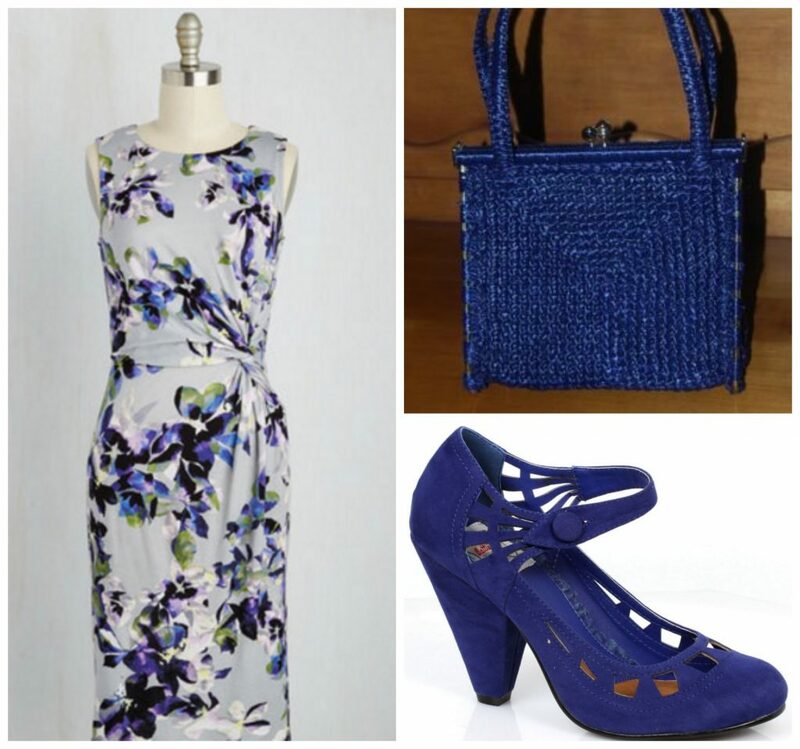 I paired it with my baby blue vintage reproduction shoes and matching vintage straw purse. 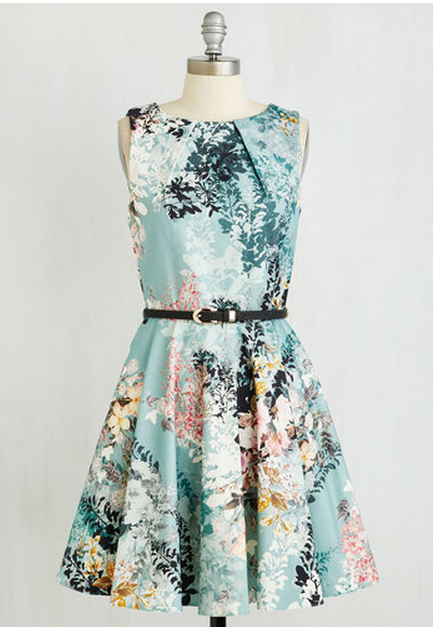 With spring in the air, it’s time for vintage style florals. A fitted shift dress can take you from day to night. You can step out to your local ice cream shop, then dance the night away in these retro reproduction microsuede heels. Find a matching vintage purse, like this sweet straw handbag by searching “blue straw purse” on eBay. You’ll be ready for any occasion. Click the links to shop* this look! See you at the soda shop! When dressing in vintage style, there’s nothing like a historical landmark to provide the perfect setting for your outfit. Luckily, Los Angeles still has a few beautiful buildings that have been preserved insteand of torn down to make way for ugly development projects. One of them is LA’s Union Station, which opened in 1939 and is the largest railroad passenger terminal in the Western United States. Conceived on a grand scale, it became known as the “Last of the Great Railway Stations.” It was placed on the National Register of Historic Places in 1980. Designed by John Parkinson and Donald B. Parkinson (the Parkinsons) with the assistance of supporting architects. 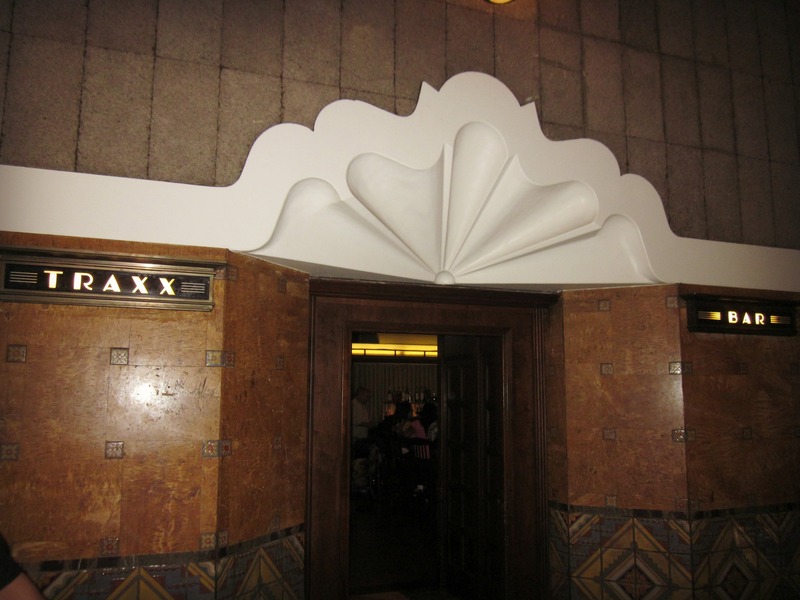 Union Station’s look combines Art Deco, Mission Revival, and Streamline Moderne style, with elements of Dutch Colonial Revival architecture. The waiting area has the feeing of elegant grandeur of a time long ago. Nestled in the corner is a place for passengers to grab a drink and rest a spell at Traxx bar. 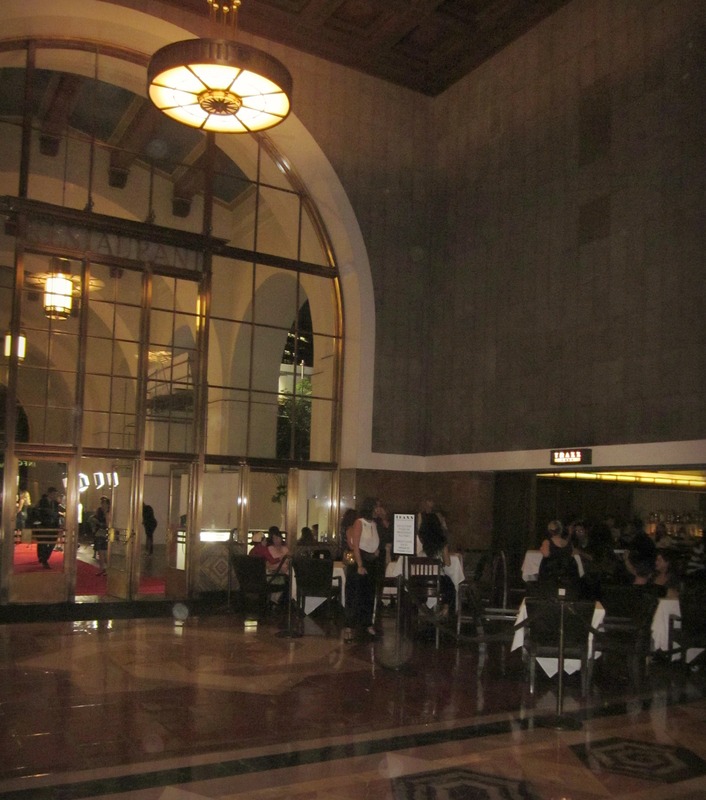 The bar is a comforting repute and also opens up to a fabulous view to appreciate the station’s lovely architecture. Across the way is a full restaurant for those on long layover from their train rides or just wanting to escape the bustle of downtown LA. For this night of having a drink at one of America’s great crossroads, I put on some comfortable yet elegant, vintage style that seemed appropriate for visiting a historical landmark. I opted for a vintage dress in warm fall colors. I actually purchased this dress from Pinup Girl Clothing’s Micheline Pitt who noted how much she loved the details of circus characters in the print and the pearl studded details in the front. 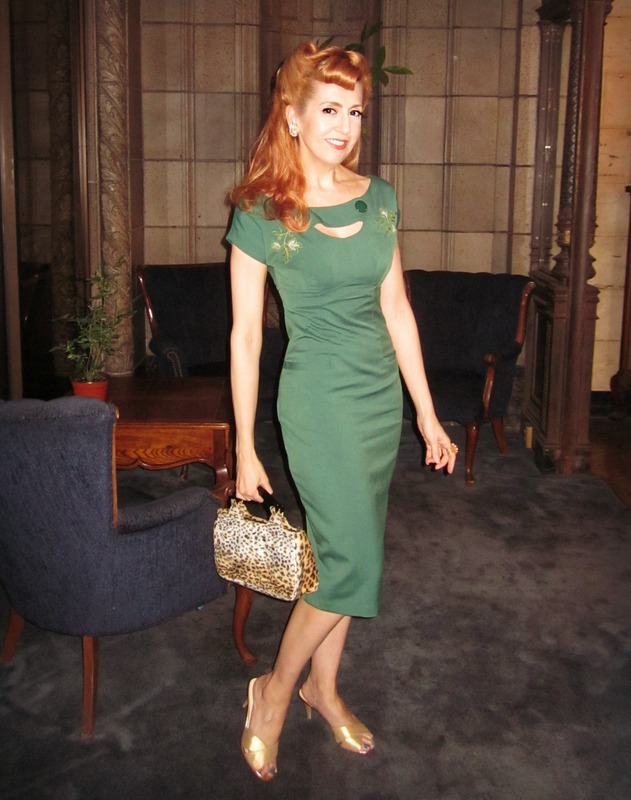 I paired it with a vintage cigar box purse and t-strap vintage inspired heels. It set nicely against the background the Union Station’s tile and for a drink at the bar. If you’re headed out to your own local historic landmark or any place that makes you feel transported back in time, bring a bit of vintage style just as ladies did a few decade ago when looking classy and feminine was de rigueur. This classic 1940s inspired chiffon swing dress features a vintage caped bodice with a teasing and pleasing keyhole, fitted waist with sash tie, and crepe lined swing skirt. A cream-colored, vintage style purse and t-strap shoes complete the look. Click the links to shop* the look! Hope you get a chance to take in a bit of history at a landmark near you! 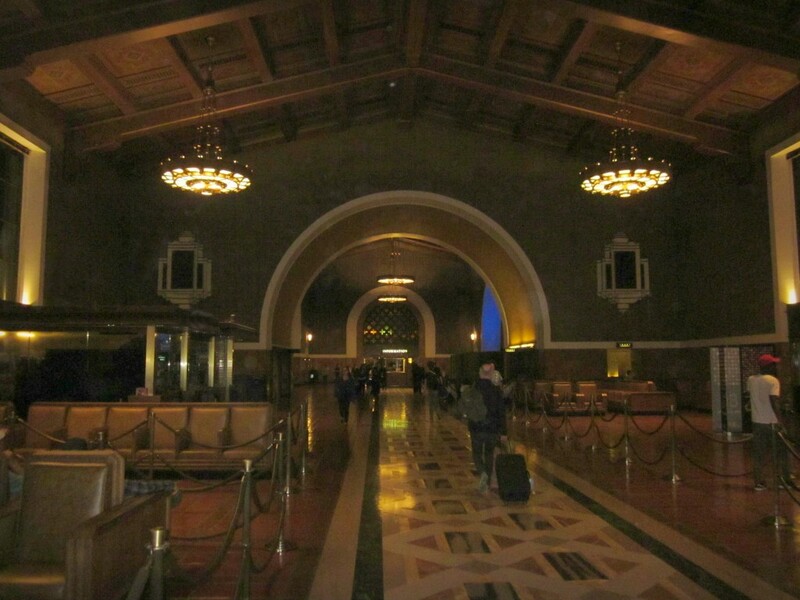 Union Station is located at 800 N Alameda St, Los Angeles, CA 90012. Traxx Bar is just inside the main front doors in the waiting area. Ladies who get together for afternoon tea time is a classic social tradition that dates back to royal Britain’s Anna, the Duchess of Bedford, who started drinking tea and eating light snacks when she became peckish in the afternoons. 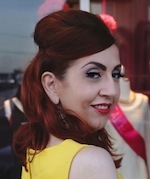 Now it’s a great excuse to get dressed up with some vintage style and get together with the girls. 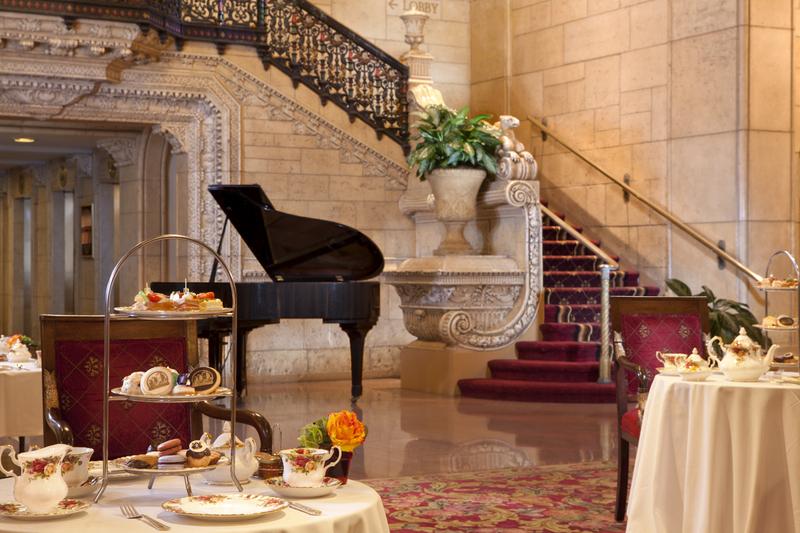 Recently, a bunch of us got together at one of Los Angeles’ prettiest tea rooms at the Biltmore Hotel. About 20 of us graced into the Biltmore’s glorious Rendezvous Court in full vintage outfits, including hats and gloves . The hotel patrons didn’t quite know what hit them as we snapped photos and took our seats at the round tables. The waiter served us tiered trays of little fingers sandwiches of salmon and egg salad as well as so many yummy cakes, cookies, scones and macaroons! We chose from a generous selection of black, white, green, oolong and herbal teas that made it all go down heavenly! And we all really enjoyed the beautiful surroundings – and I don’t just mean all my lovely gal pals! The Biltmore’s Rendezvous Court was designed by Anthony Heinsbergen. The three-story ceiling is Moorish plaster with hand-painted beams, carved wood and 24-carat gold accents. The bronze and crystal chandeliers were imported from Italy in 1923; the fountain was added in 1986 and is made of Tennessee rose marble. Our ladies tea was clearly a vintage style, dress-up event with hats and gloves recommended. We wanted to go back to a time when people dressed in their best for a special occasion. I paired a red lace vintage dress with some dramatic black accessories including a vintage, wide-brimmed hat and black silk short gloves. I added some red flower hair clips to the hat band to tie the look together. Plan a tea party with your girls and use it as an excuse to put on some glamorous vintage style of your own. This stunning dress is both feminine and unique with a beige lining topped by a black mesh overlay and velvety swirls. 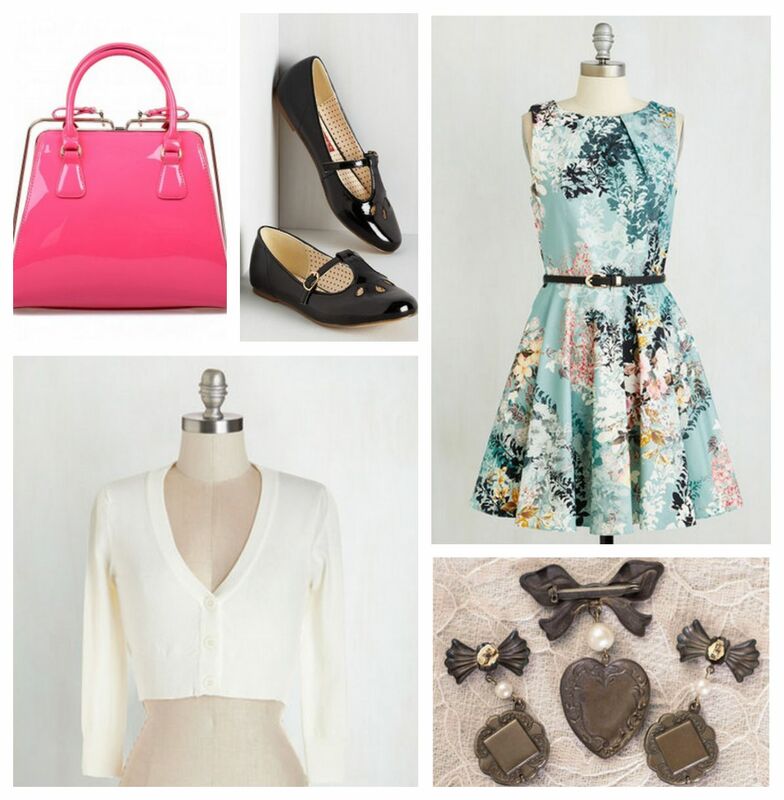 While it is new, vintage reproductions style, you can also search for an authentic vintage dress on eBay. 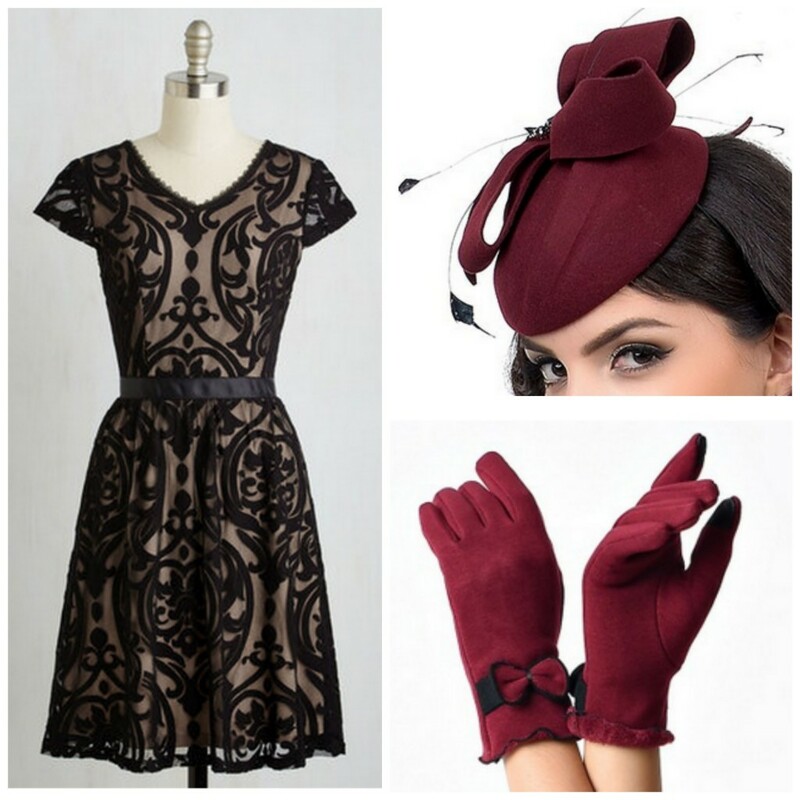 Add in some color with burgundy accessories such as a feathered hat and gloves with a black bow detail to tie back into the color of the dress. Click the links to shop* this look! Hope to get a chance to take in an afternoon tea soon! 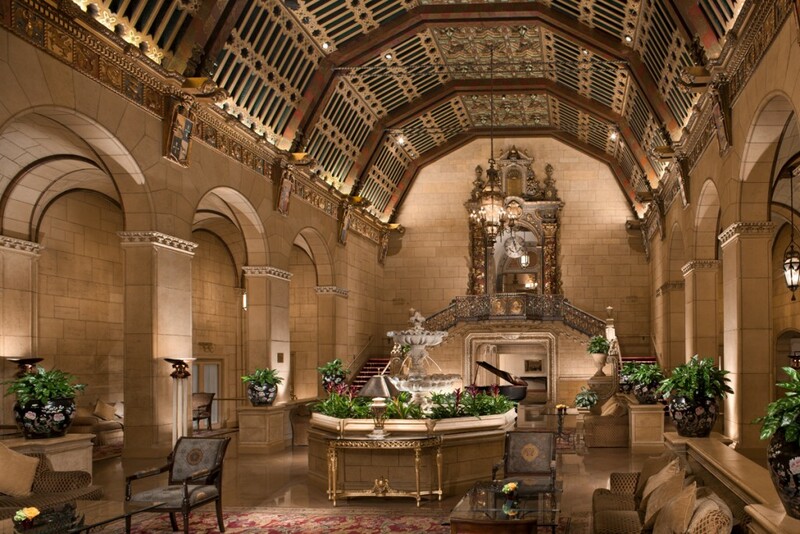 The Millennium Biltmore Hotel is located at 506 S. Grand Avenue, Los Angeles, CA 90071-2607. Traditional afternoon tea is served here Saturdays and Sundays. 2-5 p.m. Photos courtesy of the Biltmore Hotel. 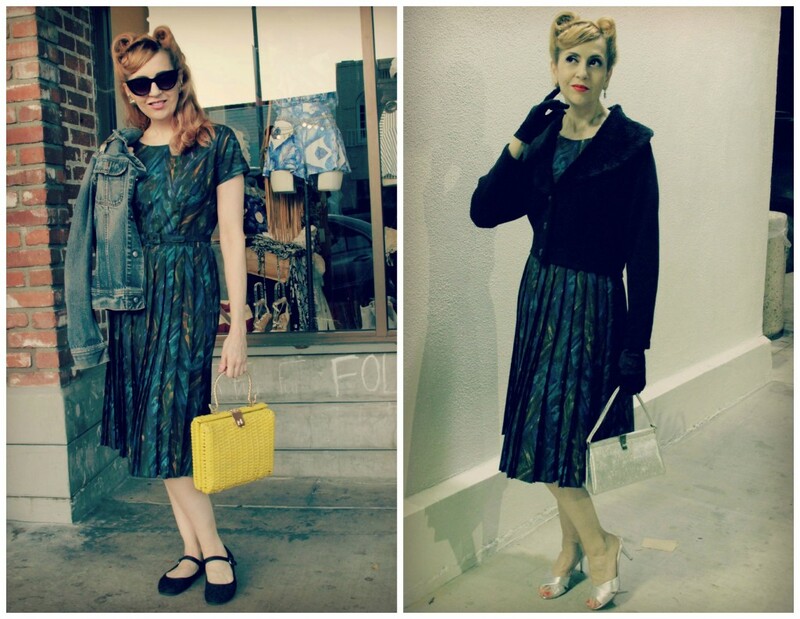 I had the great pleasure of guest blogging recently for the Pinup Persuasion blog and I shared how to use a vintage dress in a day to night outfit – because we all know what it’s like to get into a time crunch and you still want to look good! (Read the article here.) I shopped my own closet for what I had in my retro clothing collection to create a day to night outfit and I wanted to put together some tips for how to dress with style in a similar look, even when you don’t have time to go home and change. Grab a light sweater in case you catch a chill or the AC is cranked up somewhere you happen to be. A classic cardigan always works or even this little cropped sweater is perfect if you have a full circle skirt. Black flats are always a sure bet if you’re running around town, they’re comfortable and will take you through work or a day of shopping. Add some pizzazz to your outfit with a pop of color such as this bubblegum pink purse. Use accessories to add more vintage style to the look with this matching earrings and brooch set. Don’t forget your makeup, your lipstick color can totally change your fashion look from day to night. Partner this sweet retro outfit with soft pink lipstick. 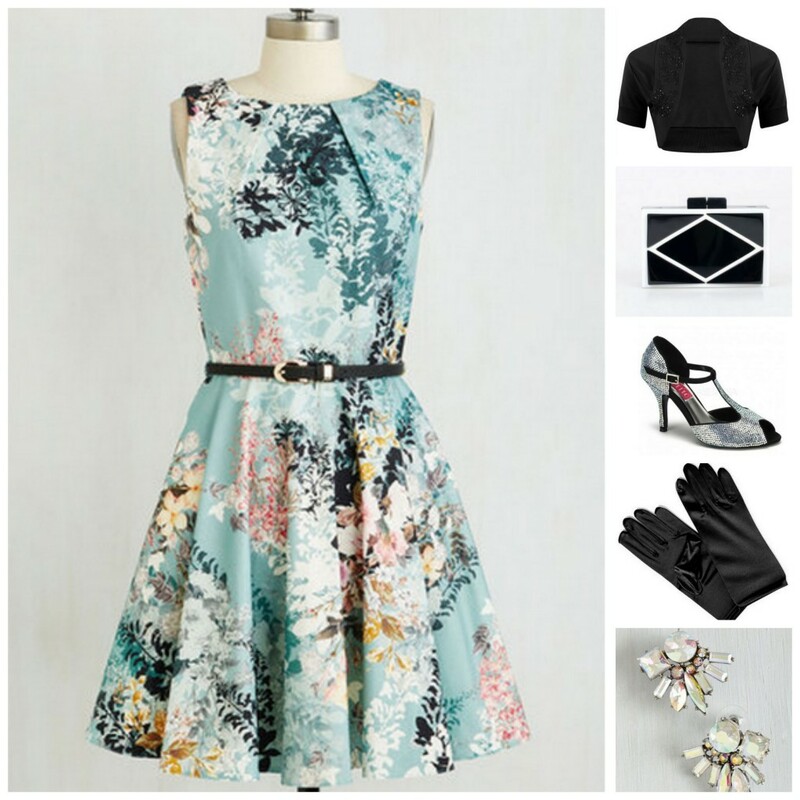 When the sun goes down it’s time to add some sparkle and drama to your retro fashion. Swap the sweater for a beaded cardigan. Carry just your essentials in a little deco style clutch. Catch the light with some rhinestone earrings and put your best foot forward in shimmery, rhinestone t-strap heels. Gloves make the look even more dramatic. Opt for satin gloves (available in the most bridal sections) or go to eBay to find a pair of vintage gloves for an even more authentic look. 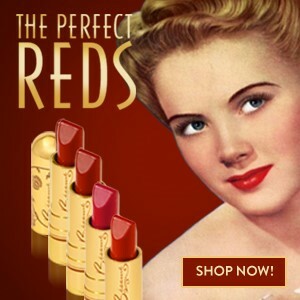 Don’t forget to change out your lipstick, a perfect red shade says classic rockabilly girl. Maybe put your hair into evening updo. Then you’ll be ready for a night on the town. All dressed up and nowhere to go? 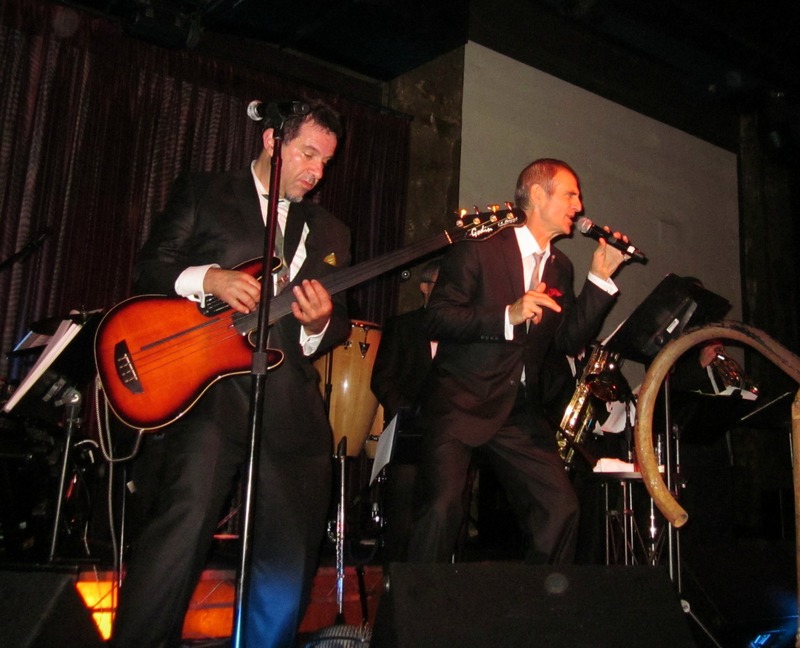 Be sure to check out the Where to Go section of Stiletto City for nightclubs in LA and other hot spots! It’s not often I venture out clubbing on a weeknight but every once in a while the stars align for a cool event at an early enough time that I can still get my beauty sleep. For the night I decided to do my own outfit mashup of punk pinup fashion, combining a vintage dress, retro hair, studded belt and spike earrings. 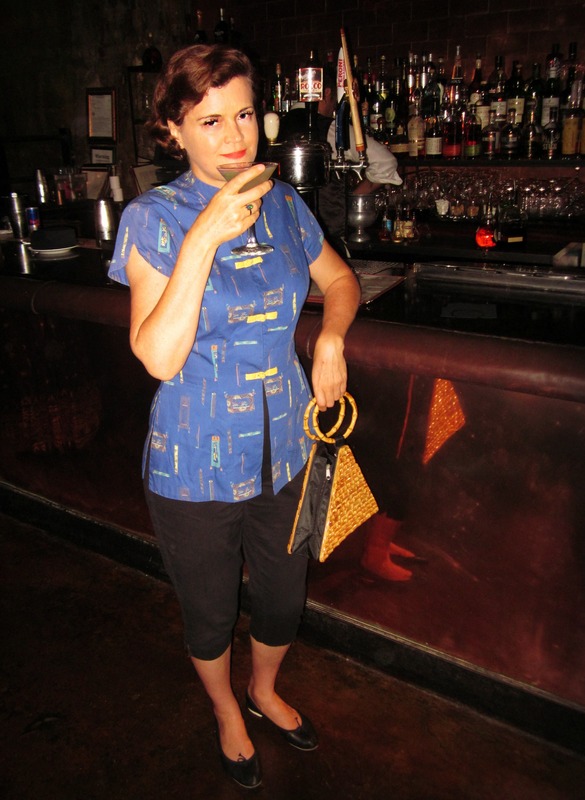 My gal pal Eva went for a vintage Polynesian look and sampled the bar’s fantastic cucumber cocktail. Try out this fun fashion statement next time you head to the bars in downtown LA or wherever you are! 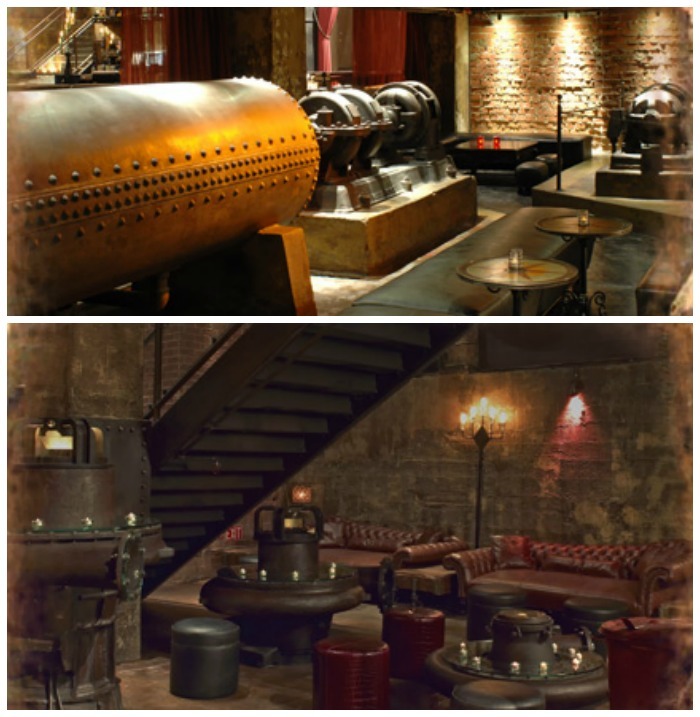 The Edison is located at 108 W 2nd St #101, Los Angeles, CA 90012. 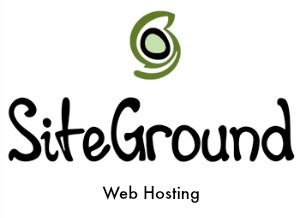 Check the website for upcoming events. TGIF! There’s nothing like going out with friends after a long week at work, getting dressed up in a great vintage style dress and wearing it out on the town. 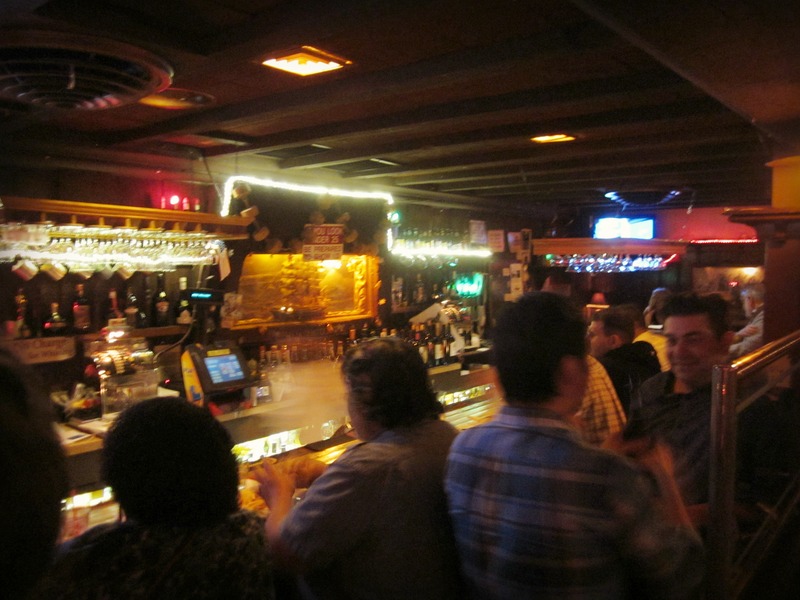 On a recent weekend I gathered my pals to meet at the HMS Bounty in Koreatown. The Bounty is an old-school, barfly bar. With its red circular booths and classic nautical décor, it feels like the kind of place Charles Bukowski would have hung out in coming up with his next great novel. The bar is adjacent to the Gaylord Apartments, a beautiful, Italian Renaissance-style building from 1924. To use the ladies room you have to pass through the lobby of the Gaylord, which is a treat in itself and great for photos ops! The area was once the hub of the famous and powerful with the Ambassador Hotel across the street and the Brown Derby restaurant around the corner. Later, The Bounty became the off-the-beaten path place to be for Hollywood rock ‘n’ roll scenesters. Now it’s in the middle of the bustling nightlife of Koreatown nightlife as the sidewalks fill with bar hopping 20-somethings. 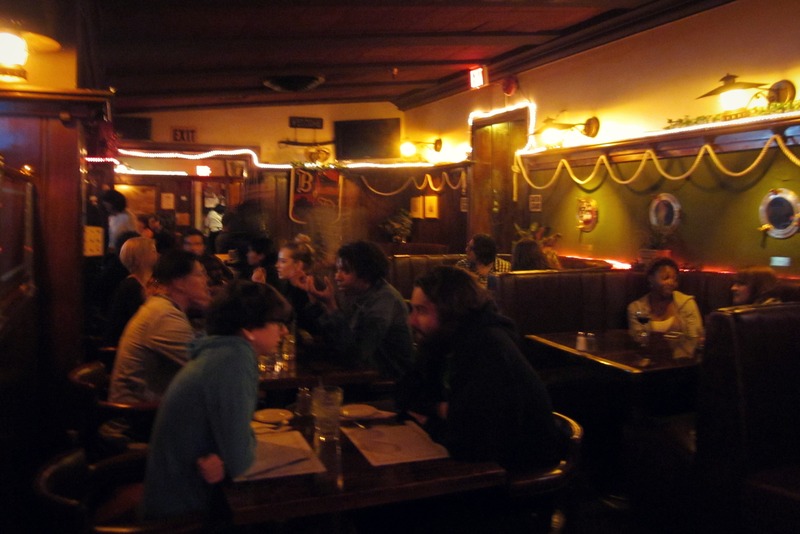 But inside The Bounty, things are mellow with local hipsters just there for a drink and conversation and maybe some of the classic meals such as a Monte Cristo sandwich or fish ‘n’ chips. It was the perfect setting for some vintage looks and classic drinks. I wore my vintage style Bettie Page by Tatyana Sierra dress that I was lucky enough to score on eBay since they don’t make it anymore. Hope you add some vintage style to next night out for a drink! 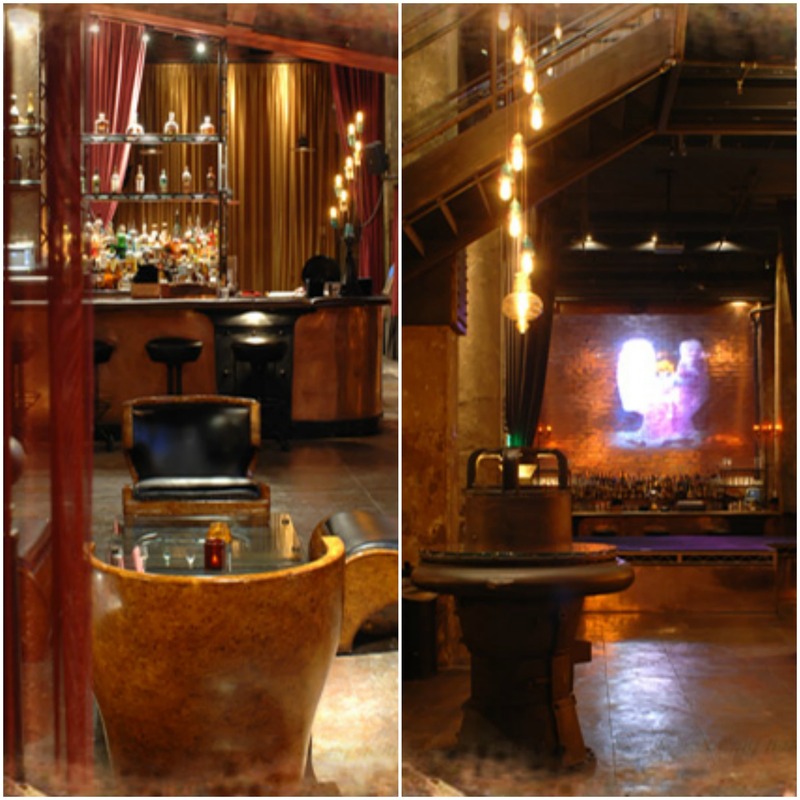 Looking for some bars in Los Angeles? Be sure to check out the Where to Go section in Stiletto City! A few weeks ago I was scrolling through Facebook when I noticed a post of some beautiful hair pieces. I saw the word “vintage” and I had to click through. 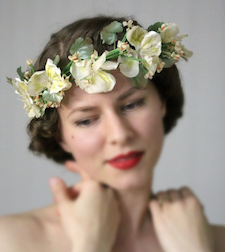 It led me to the Etsy shop of Chatter Blossom and a whole collection of gorgeous floral headbands, fascinators, crowns and clips. 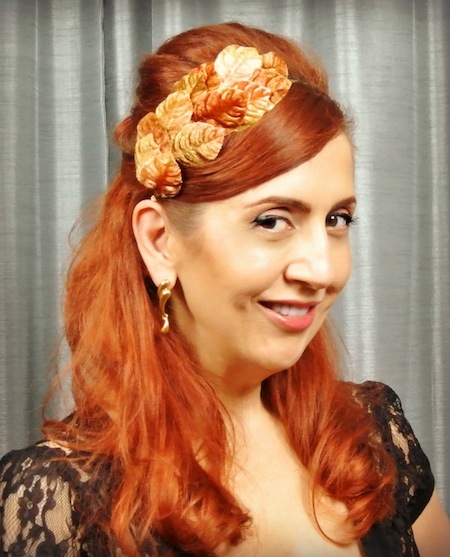 Soon, I was in possession of the “Spiced Cider” gold and brown leaf headband to celebrate my love of the fall season. 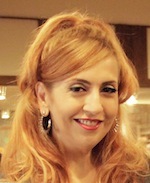 I contacted shop owner Jamie Lee to find out more about her collection. Turns out she makes all of the pieces out of vintage materials and started her Etsy shop 2 ½ years ago, as well as vending them at swing dance events in the North Carolina area where she is based. I asked her about what inspired the pieces and her background in millinery. 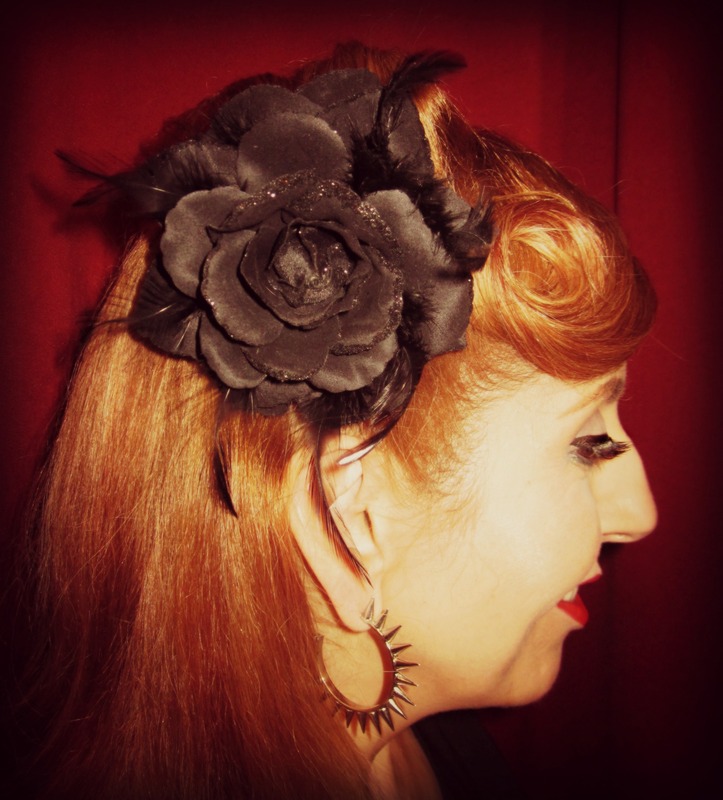 What inspired you to start creating these vintage hair pieces? I was inspired by my grandmother in the beginning. She rooted a deep love of antiques in me and taught me to treasure their craftsmanship. As I continue, I find inspiration in old photographs and in the flowers themselves. The silks, rayons, and velvets used were gorgeous and they would make nearly everything by hand, right down to the tiny plaster dipped and painted stamens of the flowers. The materials are vintage – do you collect them? How old are they? Where do you find them? All of my pieces have a vintage or antique component. 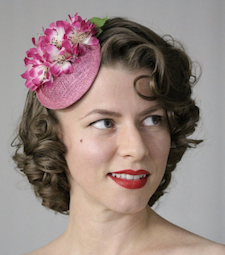 Most of my headpieces are made with vintage millinery flowers. Some are made with modern flowers but with vintage and antique button centers. There is a wide mix, which makes it interesting and varied for me personally. Most of my buttons are 100 years old! I have thousands in my collection and love all the details and stories they depict. 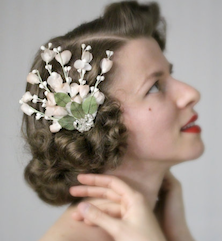 My vintage millinery flowers are mostly from the 1950s with a few from as far back as the 1920s. I found the largest portion of my collection in a single warehouse, all in their original boxes with tags. It was incredible! Do you have training in design or millinery? I am definitely a self-taught artist. I’ve always been resourceful and creative. Luckily, the very talented people making the millinery flowers decades ago have given me great bones to work with, so I just have to figure out a way to make them wearable now. Be sure to check out her shop. They make great holiday gifts, I know I have a few on my wish list! Photos compliments of Chatter Blossom. Headband featured in this blog was purchased by the author.